Genentech researchers screening hundreds of epigentics factors that might lead to the ability of pacreatic cancer cells to become more aggressive and resistant to chemotherapy have identified a histone methyltransferase called SUV420H2, that seems to encourage aggressive pancreatic cancer cells to reassume a more placid identity. Details of the researchers’ work appeared December 11 in the Journal of Cell Biology, in an article entitled, “SUV420H2 Is an Epigenetic Regulator of Epithelial/Mesenchymal States in Pancreatic Cancer.” The article suggests that targeting SUV420H2 could make pancreatic cancer cells more vulnerable to existing therapies that currently have only limited effect against this deadly form of cancer. The vast majority of cancers originate in epithelial tissues, where cells are normally organized into tightly packed sheets. As cancers progress, however, many tumor cells lose their epithelial characteristics and transition to a so-called mesenchymal state in which they detach from neighboring cells and become more mobile, allowing them to invade and form secondary tumors in other tissues. Mesenchymal tumor cells are also more resistant to chemotherapy drugs than their epithelial counterparts, and many of them appear to have stem cell-like properties that allow them to drive tumor growth. Given these unfavorable characteristics, researchers are interested in developing ways to reverse the epithelial-to-mesenchymal transition in tumors. This approach could be particularly beneficial in the treatment of pancreatic cancer, one of the deadliest forms of the disease that typically shows little response to existing chemo- and immunotherapies. 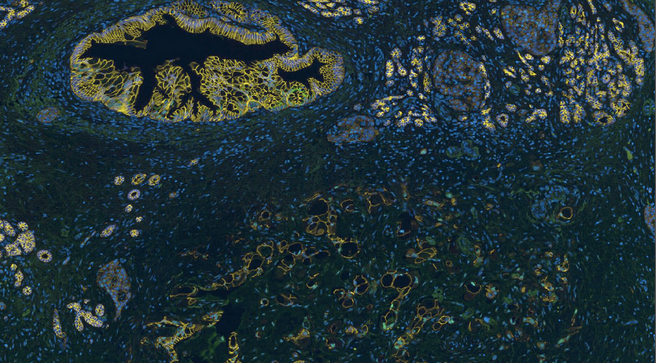 “Priming pancreatic cancers with an epithelial-inducing agent might not only decrease invasion, metastasis, and limit stem cell-like behavior, but may also increase responses to existing cancer drugs,” explained Ira Mellman, Ph.D., VP of cancer immunology at Genentech and the senior author of the current study. Mellman and colleagues, including the study's first author Manuel Viotti, screened 300 different epigenetic regulators and found that reducing the levels of SUV420H2 caused mesenchymal pancreatic cells grown in the laboratory to regain many of the characteristics of epithelial cells. The acquisition of these epithelial characteristics was sufficient to reduce cell invasion and motility and increase sensitivity to gemcitabine and 5-fluorouracil, two of the most commonly used chemotherapies in human pancreatic ductal adenocarcinoma, noted Viotti. The cells also appeared to lose their ability to act like stem cells capable of driving tumor growth. In contrast, when the researchers boosted SUV420H2 levels, epithelial-like pancreatic cancer cells were converted into a mesenchymal-like state. “An analysis of human pancreatic cancer biopsies was concordant with these findings, because high levels of SUV420H2 correlated with a loss of epithelial characteristics in progressively invasive cancer,” the article’s authors continued. Essentially, the Genentech scientists examined human pancreatic adenocarcinoma samples and saw that SUV420H2 levels were low in healthy regions of the pancreas, slightly elevated during the early stages of tumorigenesis, and strongly increased in advanced, invasive portions of the tumor that had lost their epithelial characteristics. The Genentech team concluded that their data indicated that SUV420H2 is an upstream epigenetic regulator of epithelial/mesenchymal state control. They also noted that histone-modifying enzymes such as SUV420H2 are relatively easy to target with specific inhibitory drug molecules. Nonetheless, Mellman and colleagues cautioned that it is still unclear whether or not converting mesenchymal tumor cells into epithelial cells will be beneficial for cancer patients.